Stonebridge Lock Services is a minor waterways place minor waterways place place on the waterways major waterways place village town city on the Lee and Stort Navigation (River Lee: commercial section) between Hertford Union Canal Junction (Junction of Hertford Union Canal and River Lee) (4 miles and 6¼ furlongs and 2 locks to the southeast) and Cheshunt Marsh Footbridge No 44 (6 miles and 4¾ furlongs and 5 locks to the north). 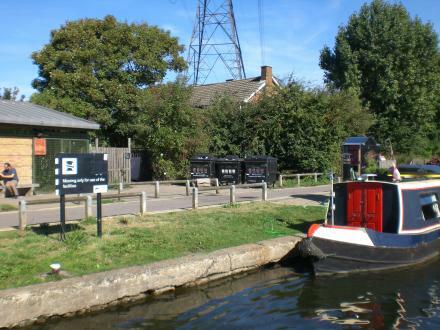 The nearest place in the direction of Hertford Union Canal Junction is Stonebridge Lock No 16; ¼ furlongs away. The nearest place in the direction of Cheshunt Marsh Footbridge No 44 is Tottenham Marshes Pipe Bridge; 3¼ furlongs away. Tottenham, London — 1376 yards to the west. London — 1627 yards to the southeast. London — 806 yards to the north. London — 1079 yards to the south. Plexal, 14 East Bay Lane, Here East, Queen Elizabeth Olympic Park, London, E15 2GW — 1490 yards to the southeast. London, UB5 6QP — 572 yards to the north. London — 1257 yards to the southwest. 117 Bruce Grove, London, N17 6UR — 1575 yards to the west. 639 High Road, London, N17 6NN — 1414 yards to the west. Bulls Cross, London, EN2 9HG — 199 yards to the northwest. 2 Forest Road, London, N17 9NH — 1364 yards to the south. London — 338 yards to the west. 6 Glover Drive, Tottenham, London, N18 3HF — 1377 yards to the north. London — 1589 yards to the west. Bill Nicholson Way, 748 High Road, London, N17 8 — 1407 yards to the northwest. London — 1191 yards to the west. London — 1324 yards to the east. Unit 6 Heslemere Business Centre, London, EN1 1TE — 1290 yards to the northwest. 17-18 Lockwood Industrial Estate, London, N17 9QP — 960 yards to the southwest. London, N17 0 — 1084 yards to the northwest. 233 Blackhorse Rd., London, E17 6 — 1452 yards to the southeast. londres, London, N17 9DR — 900 yards to the west. Ferry Ln, London — 1316 yards to the southwest. Hotspur Parade, London, N17 0 — 586 yards to the northwest. Tottenham — 1438 yards to the west. Edmonton — 1302 yards to the west. 748 High Rd, London — 1386 yards to the northwest. London — 1591 yards to the east. 731 High Road, London, N178 — 1557 yards to the northwest. Bill Nicholson Way 748 High Road, London, N1 1 — 1488 yards to the northwest. 131 Chesnut Road, London, N179 — 1429 yards to the southwest. Grow Tottenham, London — 1376 yards to the west. 48 High Rd, Tottenham, London N17 0AP, London, N17 0AP — 1461 yards to the northwest. 3-4 Highams Lodge Business CentreBlackhorse Lane, London, E17 6SH — 1121 yards to the southeast. London — 736 yards to the west. 46 Park Lane, London, N170 — 1265 yards to the northwest. London, N17 9 — 1600 yards to the west. Higham Hill, E17 — 1107 yards to the east. Tottenham Hale, N17 9LR — 1362 yards to the southwest. White Hart Lane, N17 0 — 1390 yards to the northwest. London — 1315 yards to the east. Unit 1, 2 Garman Road, London, N17 0UG — 588 yards to the north.